During the Halloween season, there are a number of halloween festivities and events to enjoy throughout Los Angeles. However, when it comes to the ultimate Halloween party, look no further than the annual West Hollywood Halloween Carnival. The event takes place on October 31st from 6pm-11pm. Instead of wondering what party to go to on Halloween, head over to Santa Monica Blvd for one of the biggest block parties around! The WeHo Halloween Carnival is more than just a block party. It’s a massive party that brings together thousands of people on Halloween who all want to have a good time. In fact, this annual event is approximated to have about half a million people walking up and down the street of Santa Monica Blvd., specifically between Doheny Drive and La Cienega Blvd. When you come to the Carnival, be sure to dress up and admire all the costumes and revelry taking place on the streets of West Hollywood. Along the streets, enjoy a number of different music stages featuring different types of music. Some stages will feature live music while others will feature DJ sets. If you work up an appetite from all the dancing, don’t worry, there will be some of the best Food Trucks in Los Angeles attending the event! The event officially runs from 6-11pm but don’t worry, there are sure to be a number of different after parties located throughout the city at various bars and restaurants along Santa Monica Blvd. It’s also important to note that this carnival is completely FREE. That’s right, attend the Carnival and enjoy FREE music and festivities. 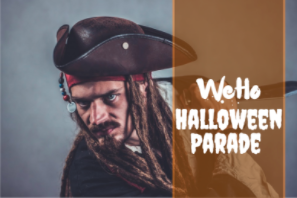 Of course, if you stop by one of the many nearby bars along the street you’ll have to pay for drinks, but don’t worry - many of the bars will have Halloween drink specials!